Phoenix, Arizona (January 29, 2019) – A transmission was intercepted from the skies above late last year, as it was revealed that Kaskade and Excision would be leading the invasion of the fifth straight Phoenix Lights Festival at The Park at Wild Horse Pass, April 5 and 6, 2019. Produced by Relentless Beats, Arizona’s leading dance music and EDM promoter recently released a second transmission… confirming this time that we indeed are not alone. Arty (recently released Save Me Tonight video) A$AP Ferg; Claude VonStroke; Decadon; GRiZ; Jay Lumen; Jeremy Olander; Malaa; Mustard; Party Favor; San Holo; Sasha; Shiba San; Spencer Brown and Throttle have all been added to the first round lineup of this continually expanding festival. Additional artists will be announced in the coming weeks, as further transmissions are received.“It is amazing to be celebrating the 5th anniversary for this marquee event and sets the stage for all the surprises we have in store for 2019,” says Relentless Beats founder Thomas Turner. The Park at Wild Horse Pass is a venue experience, specifically created with Relentless Beats and its events in mind. The custom built park situated at Wild Horse Pass in Chandler, Arizona, is continues to be optimized in order to provide the best possible experience for the Valley’s biggest promoter of electronic dance music events. The park is situated adjacent to Rawhide Event Center, on an expanding grass plot able to handle the steady growth of Relentless Beats’ marquee events. Carrying the full support of the local community, The Park at Wild Horse Pass provides an experience that will be devoid of the sound and size restrictions that are often a hinderance at previous venues. Also for those looking to make further contact with this otherworldly event, Phoenix Lights presents the 3rd annual First Encounters DJ Competition, March 15, 2019. Taking place at AURA in Tempe, AZ, aspiring DJs can compete to win an opening slot at Phoenix Lights 2019. To enter and full full details and rules, visit www.relentlessbeats.com. General Admission weekend passes for Phoenix Lights Festival are on sale now for $149, before fees. VIP weekend passes will be available at two levels: Standard VIP, including everything that a GA tickets provides, plus express VIP entrance, a commemorative lanyard, access to VIP lounge, access to VIP viewing deck, premium restrooms and passed desserts in the VIP areas. Platinum VIPincludes everything that the Standard VIP pass includes, plus: complimentary drinks, side stage viewing at the main stage, access to artist hospitality lounge, steakhouse quality dinner, exclusive festival gift bag and festival concierge. You must be 21+ to purchase Platinum VIP passes. All details and ticket types are available online at www.phoenixlightsfest.com and www.relentlessbeats.com. Phoenix Lights is an 18+ event. 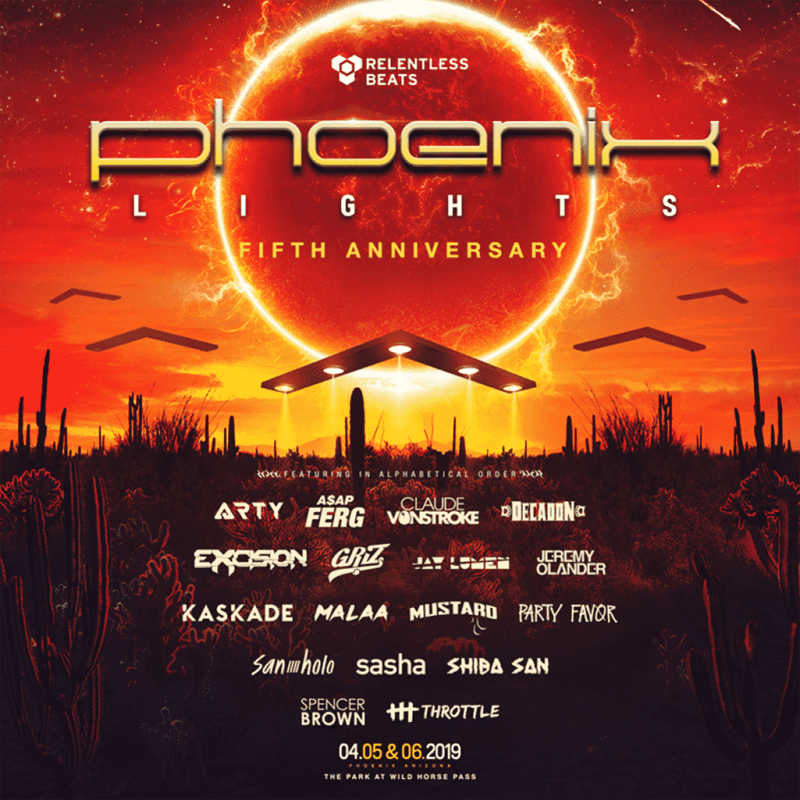 Phoenix Lights Festival is produced by Relentless Beats. Visit www.phoenixlightsfest.com for the most up-to-date information. Stay connected on Instagram and Twitter at @PHXLightsFest and on Facebook at www.facebook.com/PhoenixLightsFestival.